I’ve had the Palm Pre for nearly a week now, so I thought that it was worth a quick post! If you want to save yourself reading the rest of the post, I can summarise it for you here: the Pre is an awesome, pocket-sized piece of loveliness. I should probably qualify this, though – I am a longtime Palm fan… having previously bought a Palm Pilot, Palm IIIx, Sony Clie UX50 (which ran Palm OS), Palm Treo 650, Palm Treo 750 and Palm Treo Pro. And if they hadn’t killed the Foleo before launch, I was gonna get that, too. I was always going to want the Pre. But it really has met my expectations. It’s the device I wanted them to produce so I could justify my Palm devotion to the naysayers who were only recently predicting Palm’s demise. As a major GTD nerd, it’s a temptation to constantly tweak and tinker with my personal productivity systems. But I normally resist. This week, I’ve had a major overhaul, so thought I’d share what I’ve been doing and some of my reasons why. 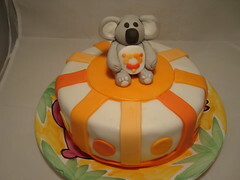 I should mention that I nicked a lot of these ideas from Gareth, so big thanks to Gareth! There were a number of reasons that motivated this. Part of it was because I’m switching from mainly using Windows Mobile phones to my new shiny Palm Pre. My presentation started as a bit of a cop-out. I was ill last week and weekend when I was planning to prepare a new presentation, so I decided to give the same talk I did at Over The Air last month and hope that I didn’t get any of the same attendees. But then I started tweaking it to suit the different audience. Over The Air is an event for mobile developers, so my presentation was pretty much aimed at mobile devs, which wasn’t quite right for a general event like barcamplondon. Then I started updating it to reflect the feedback I got, both on the day at Over The Air, and through comments and tweets since. My talk at OTA was a technical “Introduction to MQTT” session. My presentation for barcamplondon became a broader look at mobile apps that rely on data from the Internet, and the challenges and choices facing mobile app developers who write them. The aim of the talk was to discuss the pros and cons of each approach. Mobile Widgets – the new hotness? Over The Air was a month ago now, so this post has been sat in draft for way too long. But I thought it was still worth quickly sharing something noticeable from the event. By way of quick background for those who aren’t familiar with it, it is an event for mobile developers – a couple of days filled with talks and presentations on all things mobile. And this year, the big thing seemed to be widgets. There were a lot of talks on widgets. So many, in fact that you could choose a session in every time slot that was about widgets. Friday was the seventh IBM Hack Day, and I again got the chance to spend a day playing with some random ideas. 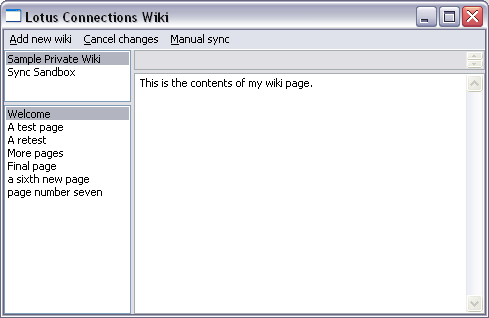 In this post, I’ll describe what I did for the last of these ideas: writing a client app for the wiki that comes with IBM’s Lotus Connections. In the same way that I am writing this post in an offline blogging client, I wanted the same for using wikis: read and make changes to a wiki while offline, with changes uploaded to the online wiki the next time you are online. This wasn’t a new idea. In fact, I tried it at IBM HackDay 4 back in 2007 but the wiki we used at work at the time had no API access for retrieving or updating wiki pages. So I sort of gave up and forgot about the idea. But now I use Lotus Connections wikis at work. And Lotus Connections does have an API – an AtomPub API that gives you feeds to know when pages are changed, and a way to publish changes. So I decided to revisit the idea. It’s still very rough around the edges (this was a HackDay – I wrote the client code in under a day!) but it already shows the basic idea. The top left view shows the list of your wikis. Clicking on this fills the list below – a list of pages in the selected wiki. Clicking on a page in that list opens the contents of the page in the main view on the right.